Viber has a Push-to-Talk (or rather Hold & Talk) feature that allows us to tap, talk and send short voice messages of up to 30 seconds to our contacts. If you haven’t used it then the feature is accessed by pressing the microphone icon present in the bottom right corner of the app. If you want to save the voice messages sent by your contacts to you then you will have to apply this special hack and you will require a computer to do so. You need to enable you file manager to Show hidden files to view and access the .ptt folder. You will find numbered files which aren’t playable by media players. The only possible way right now to save those voice messages is by actually playing and recording them using an audio recorder. Your computer is your best friend when it comes to doing this recording job. You can use free audio recording and mixing programs like Audacity to capture the audio coming in from your system while excluding the external audio from your microphone. Since you are going to use a PC, you will also need to install and authorize Viber for Windows PC or Viber for Mac. 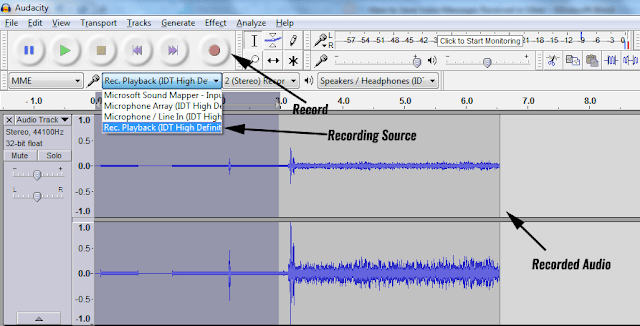 Define the audio recording source in Audacity as Playback. Play the voice message in Viber desktop. Clip out the blank parts by highlighting and pressing delete. Save the recording by exporting from File > Export Audio.